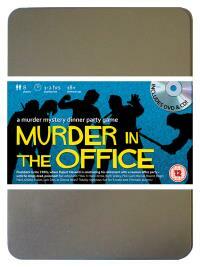 You've been invited to play the role of ROGER HARD in Murder In The Office. Who killed the boss? Everyone has stayed after work to attend Rupert Maxwell’s retirement party. Not because they like him, but because they want to make sure he is really going, once and for all. With no expense spared, his P.A. has organised an Eighties throwback disco and the cheapest bubbly money can buy - but just as the party starts the bloated M.D. falls down dead. Find out who made Maxwell’s party a real choker! Sales rep. (he’ll pump you for every last penny!) Costume : Italian designer suit, greased hair and ultra fashionable sunglasses (worn indoors only!) are the tools of your trade. Gold watch and mint fresh breath spray finish the look. You only joined the company six months ago, so you still feel like you’re getting to know people. As a sales rep, you seem to spend more time on the road than in the office. You don’t mind though as you think this job might be the start of something big. You’re proud to say that you’ve already brought in some of the biggest sales Maxwell Enterprises has ever seen. You’re getting married in a month’s time.